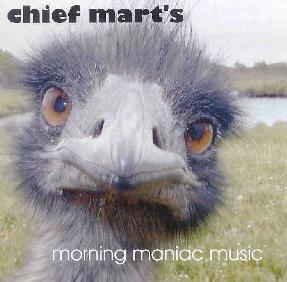 Chief Mart's - "Morning Maniac Music"
Lots of diverse influences from this Luxembourg quintet: early krautrock jamming, the cosmic era of Pink Floyd (Ummagumma, Meddle), symphonic/prog rock (Yes, Porcupine Tree), the Ozric Tentacles, and even the Orb’s sampledelic space rock. A very tight rhythm section is nicely complimented by David Gilmour-ish guitars, but the group also deftly incorporates sitar, flute, various electronics, synths and samples into a heady mix of trans-Euro instrumentals. “Bütschky” and “Gilbert Chunks” are the stellar tracks, both very atmospheric though rocking numbers in the “Astronomy Domine” style. Occasionally the band stretches out into extended astral trips: “2informations” owes much (again) to the Floyd mothership, with its metallic sheen of guitars, mantr-like synth backdrop, and hypnotic percussion. Though not quite as musically accomplished as some of the groups they clearly show allegiance to, there’s definitely a lot of common ground between the Chief Mart’s sound and that of the Ozrics. For more information you can visit the Chief Mart's web site at: http://www.chiefmarts.cjb.net. Contact via snail mail c/o Gerard Johans; 17 Rue de la Fontaine; L-3768 Tetange; Luxembourg.